Sitting is the new smoking, or so they say. They also say ‘my back’s killing me’, ‘my neck’s agony’ and ‘my shoulders are up round my ears’. Or variations on that kind of theme. I’m one of them. And when I say ‘them’ I mean freelance editors, designers, project managers, media researchers, writers, etc. And sore back/neck/shoulders is an affliction that troubles freelancers more than in-house staff, because when you work in an office you’re nipping off to meetings, or popping in to someone’s office, or over to the printer, and maybe even to the sandwich shop over the road for lunch. If I go to a meeting, it’s usually on Skype, right there in front of me. I haven’t got any colleagues to go and have a chat to. If I want to chat, I open a window in Facebook or Skype message a friend, on the screen right there in front of me. My printer is an arm’s stretch away and although I have to leave my office to go to the loo or get something to eat, I’m back within a couple of minutes to pick up the latest email, call into the next meeting, or check my PDF proofs. You get the picture. Most weekdays I do this sort of thing from about 7.30am until about 5.30pm. I try to powerwalk or go to the gym for an hour most days, but not having a schoolrun to do or a dog to walk, there is nothing forcing me to get up and move most of the time. I’m well aware that this isn’t good for me, but until last year I didn’t suffer particularly in any way, so I just got on with the work and built a reputation as someone who gets the work done and meets deadlines, which is what you’re aiming for as a freelancer. But last summer my neck, shoulder and arm all down my right side became so painful it reduced me to tears, and I was worried I’d have to stop working altogether. I spent time and money on McTimoney Chiropractic treatments, a CT scan, sessions with a physiotherapist and monthly deep-tissue massages. The scan showed that I do have an issue with some vertebrae at the top of my back, but eventually the pain eased up and it seems to be kept at bay with the monthly massages and a McTimoney session about once every four months. But I’d had a wake-up call. When the pain was really bad I asked for advice on my business Facebook page and got lots of suggestions, mostly to do with taking regular breaks. I didn’t really need telling – I know that sitting down for hours on end, hunched over a keyboard or proofs isn’t good for me, but I needed a push. I installed a month’s free trial of some software that locked my keyboard every 45 minutes, showed me stretches to do, and gave me a report at the end of the week on how well I’d done. That was fun for a while but I soon learnt where the override button was. I started to read about sit/stand desks and their benefits, and heard from a couple of people who’d already invested in them, who seemed happy with them. Then IKEA launched a well priced model (the Bekant) and another ELT freelance editor got in touch to tell me she’d just got one and it was really good, and I decided to take the plunge. If you’re not up to speed on the reported health benefits of a standing desk, you can read more here. and although it’s a bit shorter than my previous desk, it’s plenty big enough for my two monitors and a few piles of papers. One of the things I really love about it is the fact that it’s not a dining table, which my old desk was. This means there’s no ‘skirt’ so when I’m sitting I can get my chair properly tucked in so my arms and legs are at the right angle. I didn’t have to pay £500 to solve that problem, but for me it’s been a revelation. Using it is a doddle. You can fix the up and down buttons wherever you like while you assemble it and I’ve got them just to my right. Press and hold the button and the desk goes up and down without a wobble or a screech. It really couldn’t be better. You can preset heights but now I’ve been using it for a while I’ve worked out what it aligns with on the wall when it’s up/down/in the middle. For the mid setting I also bought a stool from IKEA which is designed for this purpose rather than being a stool to sit on. It’s ok as an emergency chair, but you wouldn’t want to sit on it to work. I actually find the mid setting far less comfortable than full up or down so I’ve hardly used that actually. There’s a sling fixed under the desktop where all the wires hide which makes it all really neat-looking. So now I’m the proud owner of a sit/stand desk, how do I use it? The editor who’d already bought one told me that she leaves hers at the standing height at the end of each day so if she just pops in to her office to send a quick email, she does it standing up. This has been a really valuable piece of advice and I try and do that every day. During the working day I tend to start of standing up as I check my inbox and sort myself out for the day. I try and do an hour or an hour and a half standing up, then sit down, and alternate like that throughout the day. If I’m on a Skype meeting I try and stand up. If I’m content editing I tend to sit down. For browsing the internet and social media I usually stand up. If I’m checking proofs either on screen or on hard copy I mix it up because I find that as easy to do standing up as sitting down. The biggest surprise of all has been that standing up is no hardship and if I don’t tell myself to sit down I could stand up all morning or afternoon without noticing particularly. Which is good news, because it means that neither state makes my back ache, and both are comfortable. In conclusion then, I’m on the move far more with the new desk than I was previously. If I need a file from the bookshelf behind me, I move my whole body to get it rather than swivelling in my chair. I move about while I’m standing – shifting my weight from side to side while I’m Skyping (without making it look like I’m doing a funny dance to the other callers), and when I sit down my desk is at the correct height for my body. Combining standing at the desk with sitting at it in a good position, and regular massage and occasional McTimoney seems to be working well for me. I’d recommend a sit/stand desk to anyone. The initial cost might seem high, but if you can save money in the long run with fewer trips to the osteopath or physio, it’s a good investment all round. 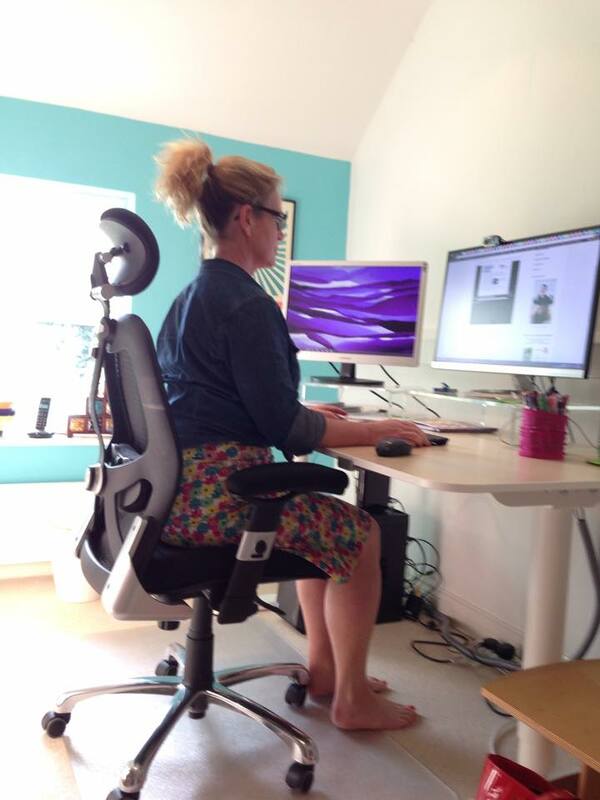 I’d love to hear your comments if you’ve tried a sit/stand desk, or decided not to get one. And how was my first proper post? Great post, Karen! I’ll definitely upgrade to one of these when I can. My current DIY set-up is fine once I’m in position, but I’d stand much more often if it was just the push of a button away! Thanks for reading, Charlotte. A DIY version has to be better than nothing. Worth saving up for though. Great post! I’m still not sure what to do about my dining table! So, it’s useful to hear about your experiences. Thanks! I didn’t realise how unsatisfactory my dining table was until I got a proper desk. Even without it being sit/stand, I think I’d advise anyone to get a proper desk rather than using a table now. I think you’re right. It’s just finding one big enough (I like to spread out!) but affordable! Interesting Karen… I too have similr problems, although more to do with a 35yr old back problem from my farming days. I also find that the height of the screen, relative to the desktop is very important i.e. keeping the head at approx right angles to your spine. There’s a lot of weight in our heads I’m told! Mick. Hi Mick. Yes, the rest of the setup is important too. Can recommend this as an extra help though. I really have to invest in one of these too and you’ve given me the push I need to start really considering it! (That’s as far as I can go right now towards spending £500 now I am working so much less) Even when I’m not working, a lot of time ends up on the computer as Facebook etc is there. I really need to start saving for one of these…. (puts a penny in a pot). Love your blog btw. Thanks, Sian! You can pop round and try mine for size any time! This is really interesting Karen, thanks so much. With my swimming, a teenager still at home and my general reluctance to be overburdened(! ), I do tend to move around a reasonable amount, but will definitely bear this is mind – I never knew such a thing even existed! Hi Kerry! Sounds like you’ve got the balance just right! Fantastic, Karen. Thanks for sharing this. Been thinking about getting one of these for a while now. Great to hear that you become so accustomed to standing so much too. Thanks for your comment, Damian. I’ve just realised I’ve been standing all day today so far. Time for a sit down! My experience has been eerily similar- I’m also an ELT writer and editor and have been experiencing neck, shoulder and arm pain in the last year. I thought I would have to quit, too. I had an MRI done, have been to see various specialists and am now working with a chiropractor and neuromuscular massage therapist. I’ve started using a hacked standing desk and will push myself to use it more and will upgrade to a full on standing desk as soon as I can. Thank you for sharing your results and the info about the Ikea desk. Hi Sarah. Gosh, that does sound very similar indeed. Do keep going with your hacked version until you can upgrade. You might spend more on the desk, but save more on all the appointments in the long run. Hope you start to see improvements soon. Great blog and it’s great to read personal experience about something so simple which delivers such major benefits. To assist you work out what is the optimum solution for you we offer 30 Free Trial of 4 different solutions. Check out http://www.sit-stand.com. Fab post!!! I want to Skype you now though, to see if I can spot the funny dance. In other news, our resident part-time DJ now mixes standing up at his IKEA ‘DJ station’ (chest-of-drawers) and loves it! Thanks Kay! DJ-ing is clearly the new editing. I’m on it! Great article. Wish they had been available in my day! This is exactly what I need! Thanks for sharing! Thanks for commenting, Angelika. Hope you can find a desk to help you too. I’m so glad you are enjoying your desk. I’m enjoying mine too. I actually think it wakes my brain up a bit. There’s something about sitting that makes me sleepy. I actually follow almost exactly the same routine as you, starting with standing in the morning and then alternating. I’m also finding that my stamina is increasing and I can spend longer and longer standing without it being a strain. One new bad habit I am picking up though is to lean one arm on my desk when I am fully absorbed in something! Not good. Despite this, I am still much more comfortable than I was when I had to sit all the time. Hooray for the standy desk! Hi Anna! Thanks for commenting here and for all of your tips before I bought my desk. Glad it’s helping you too, but I agree that leaning is the new thing not to do! I think there’s a more lo-tech hand-crank version of the Ikea desk – Skarsta (about £175). Your desk sounds interesting and I’m tempted as it might discourage my poor posture and tucking one leg under the other (possibly the cause of numbness in surface of my thigh linked to nerve damage (meralgia parasthetica)). Another plus side is the desk surface and any paper/pens on it would hopefully be out of reach of my three year old! Hi Sarah. I used to be a leg-tucker-under until the person I saw for massages gave me a good talking to. For the last couple of years I’ve been much more mindful about how I sit at my desk, even before the sit/stand desk. If you can’t break the tucking habit, try a homemade standing set up to see if it helps, before spending any money on a new desk. I’m already a convert – I’ve been using one for nearly 2 years now. I love the tip about leaving the desk up at the end of the day, though. I’ll be doing that. Hi Sarah. Have you got any other tips for us newbies? Do you feel better for using the desk all that time? Yes, it’s been one of my best investments. Like Anna, I feel more alert when standing. I’ve also taken out a subscription to Focus at Will (c. $40/year; you can try it for free, and we both get a discount if you use my referral code https://www.focusatwill.com/fwf/?rc=7687673). It plays *uninteresting* background music that really does help me to focus. I use the ‘Alpha Chill’ option, in which most tracks have a light beat that gets me moving around. Not for use during online meetings, of course. I’ll check out Focus At Will – thanks for the tip. Have you asked if you’re known as the Dancing Lady of the Village by shoppers? !